Whether you are targeting businesses or individual consumers, you can harness the power of content to build awareness, create connections, generate leads and achieve your business objectives. Done well, content marketing will allow you to build valuable trust with your potential customers before they even have a conversation with you. So, how can you generate more leads with content marketing? Most online search queries start with a desire for more information or a question that needs to be answered. It’s important that you take the time to understand what it is your potential customers are searching for so you can be present exactly where they are looking for answers. Split your target customers into different groups and define their personas. Different customer groups will have different problems or questions, so establish a content plan to ensure you cover off each topic area over time. Having a strategy that is highly targeted in this way will ensure you don’t just generate leads, but the right type of leads for your business. This can sometimes be the hardest part of content marketing. Once you have identified the content your customers are searching for, choose a format that will deliver the information with impact. Generally speaking, for lead generation you want to choose a high quality, longer format such as eBooks, case studies and white papers. If you really want to go all out, host a webinar! Make sure your content piece has a call-to-action, but keep the branding light and avoid the hard sell when using a content marketing strategy. It’s all about quality over quantity, so take the time to research the topic and make sure the finished product is polished. 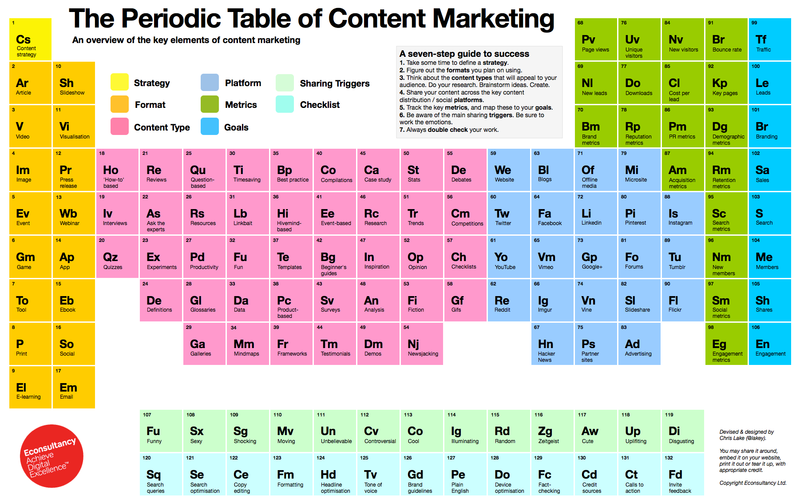 If you’re looking for some inspiration, check out Econsultancy’s fantastic Periodic Table of Content Marketing which has heaps of ideas for different formats to delight your audience. Once you have a shiny piece of content ready to go, make sure you tell people about it! Promote your content through your blog, social media and email to your database. Depending on where your customers are searching online, you may even want to promote your content through paid channels. This might be as simple as promoting your Facebook or LinkedIn post in order to reach more readers, or using services like StumbleUpon or Outbrain. Once you have a potential customer’s interest, you want to drive them to a landing page on your website where they can explore your content and offer. Content marketing for lead generation is all about give and take. You want to give a little away for free, and then in order to access the content, ask for a name and email addresses. Don’t ask for too much detail from people at this stage or they may go elsewhere. Using a landing page for content like this will allow you to effectively convert visitors into leads. Once you have a potential customer’s email address, you can nurture them with subsequent emails, content and offers and hopefully turn them into a customer. 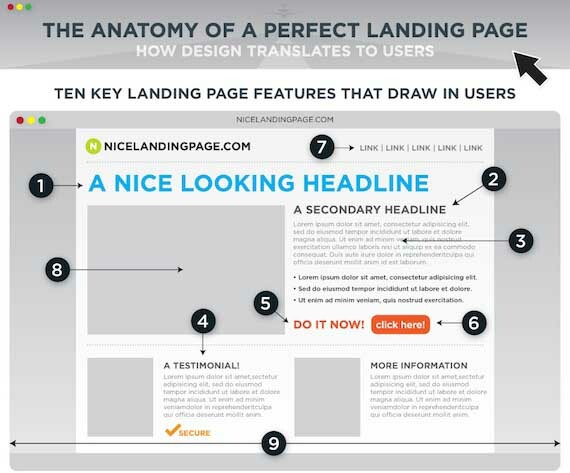 KISSmetrics have developed this great diagram showing the anatomy of the perfect landing page. So, that brings us to our last point which is make sure you provide quality content for each stage of the buying process. At any point in time you will have customers in the research or engagement stage, right through to the buying stage. At each stage, the questions are different and the content will be different. Map your content to the buyer journey, and be consistent by publishing new content regularly. No matter which stage you are creating content for, the key is to focus on creating value and a tailored call-to-action. The best content marketing strategies make potential customers feel nurtured without being pressured to buy. Done well, a solid content marketing strategy can also help you turn your customers into vocal advocates of your business, sending more and more customers your way. The ultimate lead generating tool! HubSpot has a great diagram that illustrates this perfectly. To effectively generate more leads with content marketing, you need to focus on your potential customers’ information needs and solving their biggest problems. Once you have identified this, you can start to define your customer personas and map your content to their buying journey. Use a variety of formats and promote your content through email, social media and paid channels where appropriate. Over time, a solid content marketing strategy that provides targeted content and offers will help you build trust, turning leads into customers, and customers into advocates. Not sure where to start with content marketing? We love telling stories that engage, motivate and change people. If you need some inspiration and expert advice on your content marketing, give b:content marketing a call. We’ll get people talking about you, and to you. Bianca Dillon is a certified inbound marketer and the owner of b:content marketing. With a passion for telling stories that move people, and experience from the corporate sector to government and non-profits, she knows how to be creative, get results on a budget and engage any audience.